The first Multifeatured Ajax filter that Google loves. We made it specifically for Google to index the search results and increase your Google index. You get more pages in Google focused on "long tail" keywords. You get more visitors and a higher conversion rate. And it is so easy to use too. This filter combines the best practices and features from all the top filters. You get it all. This is the first filter to focus on the SEO long tail. That’s where the sales are. We build the filter to work at its maximum speed with cached queries and hashes. By focusing on the long tail keywords you can get more targeted traffic then from top keywords. Every SEO manger knows about long tail SEO — it’s the 70% of all the keywords that people actually search which are low cost and high probability of conversion. That’s right, long tail is both cheap and efficient. You might have heard of the long tail in SEO. Some call it the Holy Grail of SEO. That’s because “long tail” terms comprise almost 70% of all search quarries. That is valuable targeted traffic that converts much better, in fact 2-3 times better. Ajax filter keeps track of all the filter queries. The most popular combinations are your first candidates for the “long tail” term. You then can edit the URL, title, H1, description and more to create a perfect page for google to index. By using Ajax Filter you will increase your Google index, drive more visitors to your site and skyrocket your sales. Don't settle for half the features — go for them all. 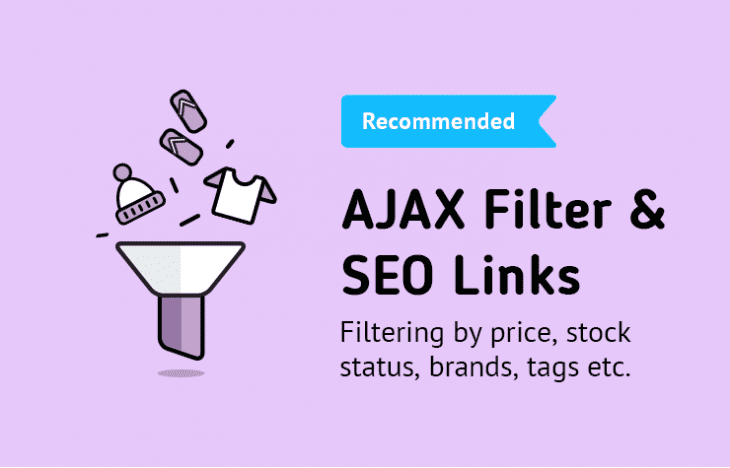 With Ajax Filter your won't need to choose which filter is right for you — there is only one filter you must have and its packed with all the great features you can think of. Select your style from our list of preset themes. It will look beautiful. You can pick a style from our presets or customize your own with out build-in theme editor options, so that the filter looks natural in any theme that you are using. You can also changed the colors of your theme to fit in nicely. This way you filter will look perfect without any coding needed. Great extension, works like magic, easy to install and customize. I am using it on Opencat 3.0.2.0.